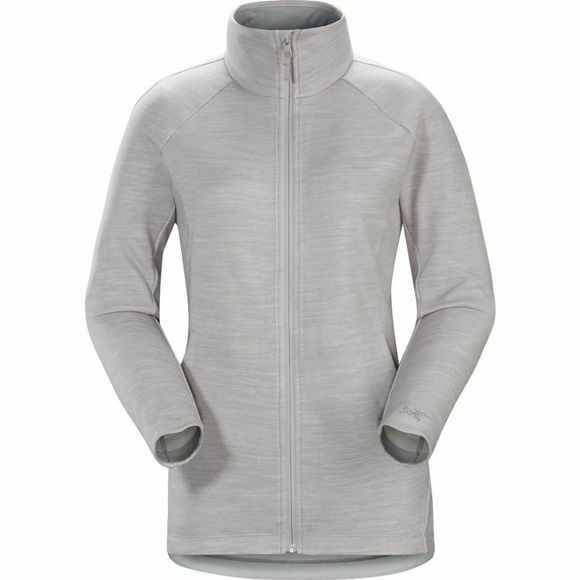 The Arc'teryx Women's A2B Vinta Jacket is a trim, lightweight fleece thoughtfully designed for the urban cyclist. Made from Alwyn, a polyester fleece fabric with a heathered face and a soft, comfortable brushed back, the jacket combines light insulation and breathability to provide thermal performance without overheating. Designed for the cyclist, the A2B Vinta Jacket employs strategically placed articulation and gussets so the jacket easily moves with your body while bending and reaching. A longer back hem means no gapping or restriction, only performance. The silhouette is trim, tailored for dynamic movement and layers easily under a shell jacket. The understated zipped hand pockets securely stow small essentials but are minimised to reduce bulk. Thumb holes keep the sleeves in place and extend coverage over the hands.